In my research for Rice, Wheat and Corn free pasta Quinoa pasta kept coming up. There is a large company called Quinoa that makes pasta only it comes with Quinoa flour and corn flour. Quinoa pasta is an entire family of pasta made from quinoa instead of the traditional ingredient of wheat. Quinoa pasta has seen a rise in popularity in the last few years, as people begin using it for health reasons, and as incidences of celiac disease become higher and more commonly diagnosed. Quinoa is a plant with its origins in the Andes of South America. It is not a grass, and therefore not a true cereal in the way wheat or rice is. The seeds are collected and eaten like a grain, and it is probably most similar to amaranth, in terms of large-production food crops. Additionally, quinoa pasta has no gluten in it, and so is a wonderful alternative for people who are gluten intolerant or have celiac. For many people, pasta is a cornerstone of their diet, and when they are diagnosed with celiac disease, or discover they can’t eat wheat for other reasons, it seems as though pasta will have to be eliminated entirely. Quinoa pasta offers an alternative to cutting pasta out, and as well as being suitable for celiac sufferers, it is healthier in many ways than traditional wheat pasta. Research by the IFAA (International Food Allergy Association) concludes as follows: "For most people who are hypersensitive to wheat, Kamut wheat can be an excellent substitute for common wheat". Dr. Eileen Yoder, president of the IFAA, along with a team of independent scientists and doctors, arrived at this conclusion after their study with two groups of people, those with an immediate immune reaction and those with a delayed immune reaction. In this last group, 70 percent showed an increased sensitivity to common wheat than Kamut wheat. In the first group -- people with serious allergies -- 70 percent did not react, or did react very slightly, with Kamut wheat. However, serious allergy sufferers should always consult their doctor first. Kamut brand grain has become The Wheat You Can Eat! 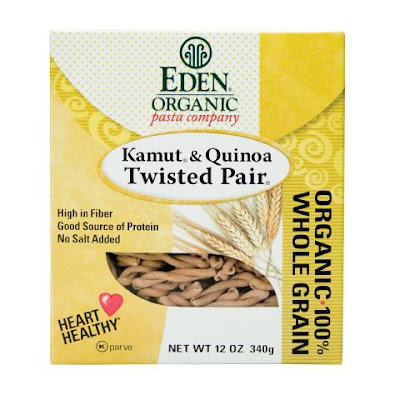 All EDEN Organic Pasta is packaged in boxes made from recycled and recyclable paperboard, one of the most environmentally friendly packages available. According to the 100 percent Recycled Paperboard Alliance (RPA100.com), "Fourteen trees are saved for each ton of paperboard converted to 100 percent recycled paperboard. Trees are critical to the sequestration of CO2 (a greenhouse gas) in North America. For each ton of paperboard converted to 100 percent recycled paperboard, an equal amount of recovered fiber has been diverted from municipal landfills. Production of 100 percent recycled paperboard uses 50 percent less energy compared to virgin grades of paperboard, thus significantly reducing the greenhouse gases released into the environment." Shelby, have you found any pasta made just from quinoa without corn and any type of wheat? Hi John~ I have not. You can always make it yourself. You can grind down the quinoa into a flour and make the pasta that way. I am not sure if it would taste well, but it is worth a try. :) Let me know if I can help in any other ways. I have made quinoa pasta from scratch with no other flours. Its not bad. just make sure you get it rolled out very thin. I wish that someone would make a quinoa-only pasta, or quinoa-amaranth. I would be a customer for life if they came out with that product. Kamut is not gluten free. Good recommendation! For sure, it's a healthy and tasty substitute.